At this point, let me take the opportunity to mention what while our Olympics-level star athletes litter the headlines in disgrace, accused of performance-enhancing drugs, or of slaying their blonde-supermodel girlfriends, no movie critic ever sat in the dock accused of killing his blonde-supermodel girlfriend...Well, okay, none of us movie critics ever get to have blonde-supermodel girlfriends in the first place. That's in the damned job description. Most of us assume it's a joke when we sign the contract. Anyway, point is, most of those lovely female victims of psychotic jock rage would still be alive today, if only they'd been attracted to movie critics instead. They'd be bored, perhaps. Socially ostracized, certainly. But at least still alive. OLYMPIA PART 2 is the second half of Leni Riefenstahl's epochal record of the 1936 Berlin Olympics, produced under Nazi authority. Amazing Untrue Fun Fact: the original title was OLYMPIA PART 2: FESTIVAL OF BEAUTY: BASED ON THE NOVEL PUSH BY SAPPHIRE, but that tested poorly with Goering, Mengele and the High Command (the Tom Cruise guy from VALKYRIE, meanwhile, was undecided ). The feature begins with a striking sequence of young male athletes (overwhelmingly blond and, presumably, blue-eyed) warming up in a misty wood, showering and bathing together (any traumatic flash-aheads to the Gay Games in Cleveland are your own problem), a sequence described by one writer as turning the Olympics into "Nordic mystery." Riefenstahl's MO was always to emphasize the sheer visual splendor of the games, more so than a mere accounting of who won what. 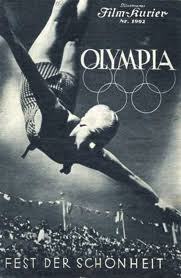 This runs through a greater variety of events than OLYMPIA PART 1, and includes diving and water sports - note the sailboat races, partially filmed from balloon-mounted aerial cameras. There are equestrian contests, gymnastics, bicycling and the decathlon, which is won by America's Glen Morris. Perhaps the most unnerving, in hindsight, is the sharpshooting. For, as we know, there will be a lot more gunfire taking place subsequently, and the targets will be human. While the diving segment is especially noteworthy (and has been issued at least once as a separate video), most striking visually are the sculling races, in which Riefenstahl mounted cameras on the oars themselves, to capture the piston-like rhythm of the rowers.